Offering you a complete choice of products which include open vision. 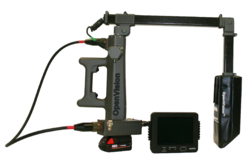 OpenVision LT-NDT is a light weight portable X-ray system for hand-held inspection. It includes a highly sensitive X-ray imager and battery-operated 70kV X-ray tube designed for portable field operation. This unit’s 4″x 6″ imaging area and realtime video allows the operator to quickly scan a range of specimen and pipe sizes. Moving the X-ray source provides a 3D perspective, and moving closer or farther from the specimen allows for increased detail resolution or field of view. Images are presented on a high-resolution 7″ LCD display or on a heads-up display mounted to a hard hat. ADV SD card recorder can be attached to the system to store the video image or capture still images.